While kennels range from the barebones to the ultra-fancy, keep in mind that the frills are meant mainly for owners. Your ferret really isn't interested in what color his enclosure is. What is important is general safety and the friendliness and competence of the staff. The first thing you should do when trying to find the right kennel for your ferret is visit the kennel beforehand. Most kennels welcome these visits, and it gives you a chance to see their facilities and ask specific questions. Your questions should be answered to your satisfaction, so that you will feel comfortable leaving your pet when you are away. The kennel should be clean inside and out. One of the most important aspects of preventing the spread of contagious diseases is proper sanitation. The cages and runs should look and smell clean. Animals that are currently boarding should be clean and look well cared for. Indoors, the boarding facility should have adequate cage sizes. Each ferret should have its own individual cage, and not be too near other animals. In fact, your ferret should not have any contact with other animals in order to decrease the potential of aggression and spread of disease. It is usually preferred that ferrets are not boarded in the same facility as dogs, because dogs tend to bark and ferrets prefer a quiet environment. The presence alone of some dogs might cause a great deal of stress in certain ferrets, especially if the dogs are within direct view. The general boarding environment should be pleasant and feel comfortable. Natural lighting from windows is great, but if not available, there should be adequate indoor lighting. The area should be relatively quite, although some kennels play music or the radio, which can also be quite soothing. The air should circulate well and not smell stagnant. Although your ferret is being boarded he will still need to be provided with certain stimuli and opportunity for some exercise. Some cages have blankets and areas that the ferret can burrow or hide. These provide greater comfort, but are much more difficult to keep clean. Find out how many animals are routinely boarded at a single time, how much experience the staff has with ferrets and the number of staff taking care of the animals. More people and fewer animals may mean more attention for the individual animals. Some kennels have associations with specific veterinarians either on the premises or working near by. If your ferret becomes ill while boarding, discuss how this will be addressed. The kennel's veterinarian may be the one contacted for treatment to be provided, or it might be your regular veterinarian. If you have a specific preference, discuss this with the kennel owner. If your ferret is on medication that is given several times a day, make sure that the kennel personnel are able to administer it appropriately. Some kennels may not be able to give medication as often as your ferret requires. Some facilities offer an added bonus of grooming services. 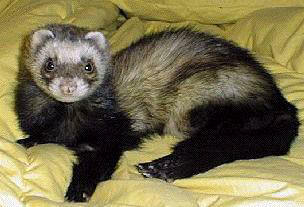 Consider having your ferret groomed the day he or she is scheduled to go home. It is always nice for your ferret to come back from the kennel smelling clean, fresh and newly groomed. All ferrets that are to be boarded should be healthy and free of contagious diseases. If your ferret has a medical problem that is stable or currently under treatment, let the kennel know prior to boarding to make sure they will accept him. A kennel may require a health certificate from your veterinarian and proof of your ferret’s most recent vaccinations. If your ferret has fleas or other external or internal parasites, he or she should be treated prior to arrival or on admission to the kennel. Certain kennels have very specific requirements regarding vaccinations. Don’t assume that your ferret has had all of the vaccinations required without checking with the kennel first. Most of the time, a letter from your veterinarian will be all that is required. Other times, additional vaccines may need to be given. It is always a good idea to bring your ferret’s own food to the kennel. Abrupt changes in food may lead to diarrhea in some ferrets, especially when they are in a more stressful environment away from home. Abrupt dietary changes in ferrets may also lead to anorexia since most ferrets do not like changes in their routine. If your ferret is on a special diet or has special dietary needs make sure the kennel is aware of this and that they follow your specific instructions. It might be a good idea to bring your ferret’s own litter. He may be reluctant to use a different type of litter, especially in a strange environment. If your ferret has a special bed or favorite toy, ask if you can leave it with your pet. Familiar items from home will make your pet feel more comfortable while you are away. The kennel should have several contact numbers available so the appropriate people can be contacted in the unlikely event of an emergency. First, provide the number where you can be reached while you are away. If you are unavailable, a friend or relative's number should be accessible. This person should be able to make any emergency decisions if needed. Discuss your wishes with this person prior to your leaving. The kennel should also have your veterinarian's number in case there are medical problems. This is even more important if there are any on going medical problems with your pet. If your ferret typically receives medications at home, they should be continued while boarding. Bring the medications with you to the kennel, and make sure the kennel is aware of the specific problem being treated. If you do not feel that kenneling is appropriate for your ferret, you may want to consider hiring a pet sitter. These animal loving people will come to your home to care for your pet. Some may even spend the night.